Ledum is an evergreen shrub, Ledum palustre. This plant grows wild in Canada, northern Europe, and the cooler regions of North America as far south as Wisconsin and Pennsylvania, reaching a height of 1–6 ft (0.3–2 m). It has narrow, dark, aromatic leaves with hairy or wooly undersides. The leaves, either dried or fresh, are used primarily in homeopathic healing, but have also been used in Native American and Russian folk medicine. During the American Revolution when the British imposed a tax on imported tea, the American colonists used ledum as a tea substitute. 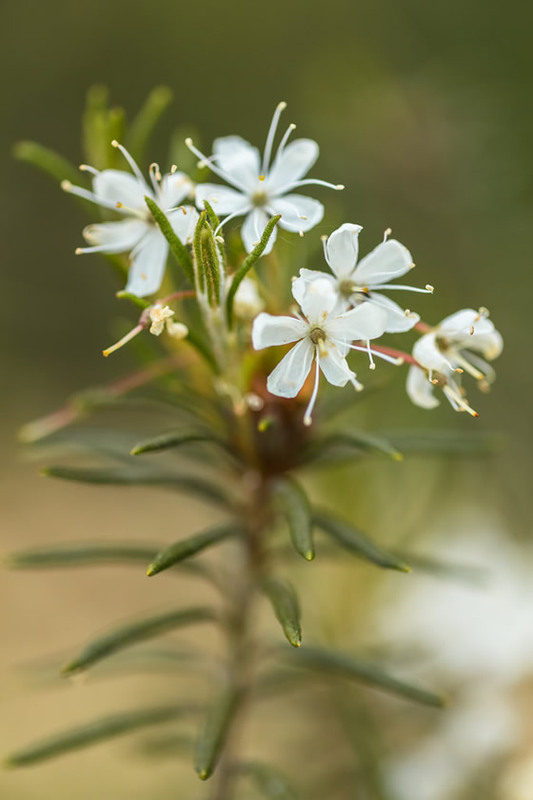 Other names for ledum include marsh tea, Labrador tea, wild rosemary, James’s tea, and ledum latifolium. Homeopathic medicine operates on the principle that “like heals like.” This saying means that a disease can be cured by treating it with products that produce the same symptoms as the disease. These products follow another homeopathic law, the Law of Infinitesimals. In opposition to traditional medicine, the Law of Infinitesimals states that the lower a dose of curative, the more effective it is. To achieve a low dose, the curative is diluted many, many times until only a tiny amount, if any, remains in a huge amount of the diluting liquid. In homeopathic terminology, the effectiveness of remedies is proved by experimentation and reporting done by famous homeopathic practitioners. Ledum was proved as a remedy by the German founder of homeopathy,Dr. Samuel Hahnemann (1775–1843). Other homeopathic uses for ledum include the treatment of stiff and painful joints, especially when the pain begins in the feet and ankles and moves upward. Ledum is also used for sprained ankles. According to some homeopathic practitioners, ledum is said to take away the craving for alcohol. 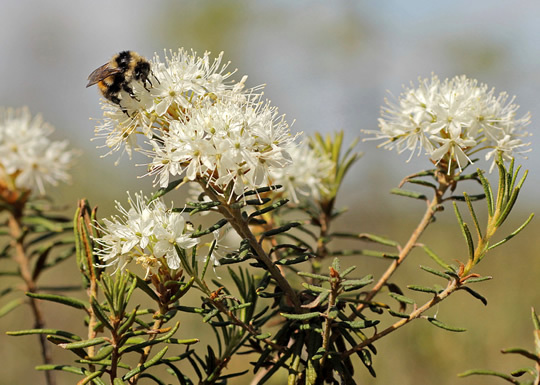 Since 1995, ledum has been touted as a homeopathic remedy for Lyme disease. Originally prescribed by a holistic veterinarian in Connecticut to treat the symptoms of Lyme disease in horses, dogs, and cats, ledum in the 1M potency is now recommended by some alternative practitioners as a treatment for Lyme disease in humans. There are several anecdotal reports of its success in treating this painful disease. In homeopathic medicine the fact that certain symptoms get better or worse under different conditions is used as a diagnostic tool to indicate what remedy will be most effective. Symptoms that benefit from treatment with ledum get worse with warmth and are also worse at night. Symptoms improve with the application of cold. Homeopathy also ascribes certain personality types to certain remedies. The ledum personality is said to be discontented and self-pitying. People with the ledum personality may be irritable, angry, impatient, worried, and want to be left alone. People in need of ledum often have restless, disturbed sleep marked by bad dreams. Ledum is also used in Native American and Russian folk healing. In Russian, ledum is called bogulnik. Both these cultures use decoctions or infusions of ledum to treat coughs, bronchitis, and bronchial asthma. According to historical records, the famous Swedish botanist Karl Linneaus (1707–1778) was the first to record using ledum for sore throats and coughs. In addition, Russian folk medicine uses ledum mixed with butter to make an ointment that is applied externally to treat scabby dandruff, skin infections, bruises, wounds, and bleeding. Used externally, it is believed to act as an antibiotic and an anti-fungal to reduce infection. 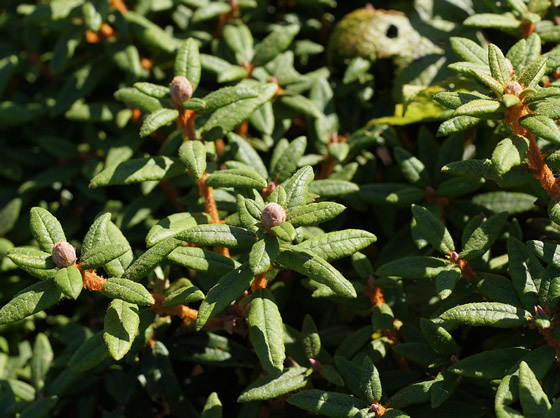 Mainstream medical researchers have studied ledum within the field of environmental medicine. Some Russian animal studies from the mid-1990s indicated that ledum offers some protection against radiation damage to the digestive system and the formation of red blood cells. A Canadian study completed in the summer of 2002 reported that ledum is a highly accurate indicator of high environmental concentrations of lead. Ledum is also being studied for its beneficial effects when eaten as a vegetable. A 2002 report from the School of Pharmacy at the University of London states that ledum has a high level of antioxidant activity, and shows promise as a treatment for gout, diseases related to aging, and central nervous system disorders. Ledum is prepared by picking the leaves, small twigs, and flowers in the late summer. These can be used fresh or dried to make an infusion (tea) or a decoction. For homeopathic remedies, the dried plant material is ground finely then prepared by extensive dilutions. There are two homeopathic dilution scales, the decimal (x) scale with a dilution of 1:10 and the centesimal (c) scale where the dilution factor is 1:100. Once the mixture is diluted, shaken, strained, then re-diluted many times to reach the desired degree of potency, the final mixture is added to lactose (a type of sugar) tablets or pellets. These are then stored away from light. Ledum is available commercially in tablets in many different strengths. Dosage depends on the symptoms being treated. Homeopathic and orthodox medical practitioners agree that by the time the initial remedy solution is diluted to strengths used in homeopathic healing, it is likely that very few if any molecules of the original remedy remain. Homeopaths, however, believe that these remedies continue to work through an effect called potentization that has not yet been explained by mainstream scientists. As an infusion for treating respiratory distress and coughs, 1 oz (30 g) of dried leaves is added to 1 qt (1 L) of boiling water. Puncture wounds from rusty nails, needles, animal bites, and similar implements can be serious and may result in tetanus. When treating puncture wounds with ledum, patients should make sure their tetanus immunizations are current, monitor their healing, and seek traditional medical help at the first sign of infection. People who bruise very easily should consult a physician, as this condition is sometimes caused by blood disorders and other serious conditions. Ledum taken in the standard homeopathic dilutions has not been reported to cause side effects. A tea made from ledum has been safely taken for centuries. Studies of interactions between ledum and conventional pharmaceuticals are nonexistent.